This article is about the microwave spectrum. For the Super NES and Sega Genesis online adapter, see XBAND. For the radiation band that is not RF, see X-ray. For musical artists with the name X, see X (disambiguation). X band is used in radar applications including continuous-wave, pulsed, single-polarization, dual-polarization, synthetic aperture radar, and phased arrays. X band radar frequency sub-bands are used in civil, military, and government institutions for weather monitoring, air traffic control, maritime vessel traffic control, defense tracking, and vehicle speed detection for law enforcement. 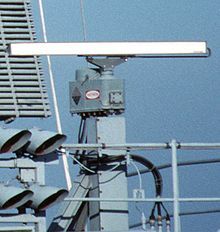 X band is often used in modern radars. The shorter wavelengths of the X band allow for higher resolution imagery from high-resolution imaging radars for target identification and discrimination. In Ireland, Libya, Saudi Arabia and Canada, the X band 10.15 to 10.7 segment is used for terrestrial broadband. Alvarion, CBNL, CableFree and Ogier make systems for this, though each has a proprietary airlink. The Ogier system is a full duplex Transverter used for DOCSIS over microwave. The home / Business CPE has a single coaxial cable with a power adapter connecting to an ordinary cable modem. The local oscillator is usually 9750 MHz, the same as for Ku band satellite TV LNB. Two way applications such as broadband typically use a 350 MHz TX offset. Portions of the X band are assigned by the International Telecommunications Union (ITU) exclusively for deep space telecommunications. The primary user of this allocation is the American NASA Deep Space Network (DSN). 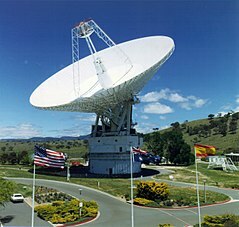 DSN facilities are in Goldstone, California (in the Mojave Desert), near Canberra, Australia, and near Madrid, Spain. Notable deep space probe programs that have employed X band communications include the Viking Mars landers; the Voyager missions to Jupiter, Saturn, and beyond; the Galileo Jupiter orbiter; the New Horizons mission to Pluto and the Kuiper belt, the Curiosity rover and the Cassini-Huygens Saturn orbiter. An important use of the X band communications came with the two Viking program landers. When the planet Mars was passing near or behind the Sun, as seen from the Earth, a Viking lander would transmit two simultaneous continuous-wave carriers, one in the S band and one in the X band in the direction of the Earth, where they were picked up by DSN ground stations. By making simultaneous measurements at the two different frequencies, the resulting data enabled theoretical physicists to verify the mathematical predictions of Albert Einstein's General Theory of Relativity. These results are some of the best confirmations of the General Theory of Relativity. The International Telecommunications Union (ITU), the international body which allocates radio frequencies for civilian use, is not authorised to allocate frequency bands for military radio communication. This is also the case pertaining to X band military communications satellites. However, in order to meet military radio spectrum requirements, e.g. for fixed-satellite service and mobile-satellite service, the NATO nations negotiated the so-called NATO Joint Civil/Military Frequency Agreement (NJFA). (S5.461) 1. Essential military requirements for satellite downlinks; the mobile satellite sub-band 7250-7300 MHz is for naval and land mobile earth stations. 2. Military requirement for fixed systems in some countries. 1. This is a harmonised NATO band type 1 for satellite downlinks. 2. 7250-7300 MHz is paired with 7975-8025 MHz for the MOBILE-SATELLlTE allocation. 3. The FIXED and MOBILE services are not to be implemented in the band 7250-7300 MHz in most NATO countries, including ITU Region 2. 4. In the band 7300-7750 MHz the transportable earth stations cannot claim protection from the other services. MHz FIXED Military requirements for existing NATO fixed systems in some countries. 1. Essential military requirements for satellite uplinks; the mobile satellite sub-band 7975-8025 MHz is for naval and land mobile satellite earth stations. 2. Military requirement for earth exploration satellite (downlink) purposes in the band 8025-8400 MHz. 3. Military requirement for fixed systems in some countries. 1. This is a harmonised NATO band type 1 for satellite uplinks. 2. 7975-8025 MHz is paired with 7250-7300 MHz for the MOBILE-SATELLlTE allocation. 3. The FIXED and MOBILE services are not to be implemented in 7975-8025 MHz in most NATO countries, including ITU Region 2. 4. In the bands 7900-7975 and 8025-8400 MHz the transportable earth stations must not cause harmful interference to other services. Radiolocation Military requirement for land, airborne and naval radars. Harmonised NATO band type 2 in selected sub-bands is desirable. The Radio Regulations of the International Telecommunication Union allow amateur radio operations in the frequency range 10.000 to 10.500 GHz, and amateur satellite operations are allowed in the range 10.450 to 10.500 GHz. This is known as the 3-centimeter band by amateurs and the X-band by AMSAT. Motion detectors often use 10.525 GHz. 10.4 GHz is proposed for traffic light crossing detectors. Comreg in Ireland has allocated 10.450 GHz for Traffic Sensors as SRD. Many electron paramagnetic resonance (EPR) spectrometers operate near 9.8 GHz. Particle accelerators may be powered by X-band RF sources. The frequencies are then standardized at 11.9942 GHz (Europe) or 11.424 GHz (US), which is the second harmonic of C-band and fourth harmonic of S-band. The European X-band frequency is used for the Compact Linear Collider (CLIC).